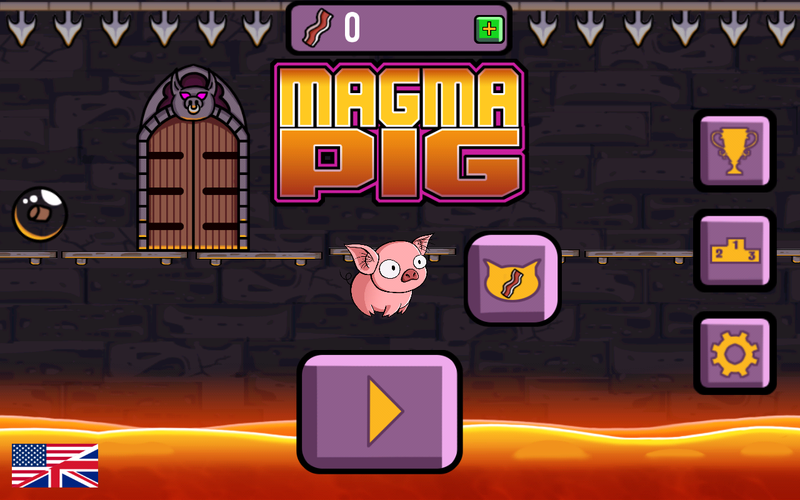 Other Projects / [Released] Magma Pig for Android! 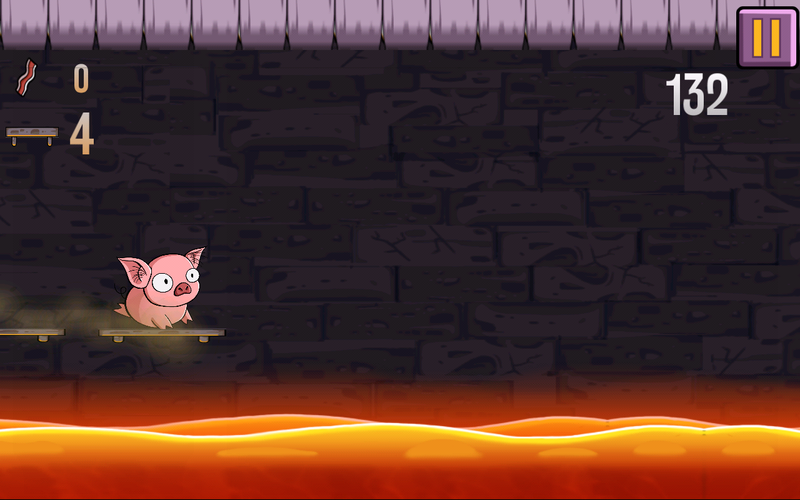 MAGMA PIG out for Android devices! Hey everyone! 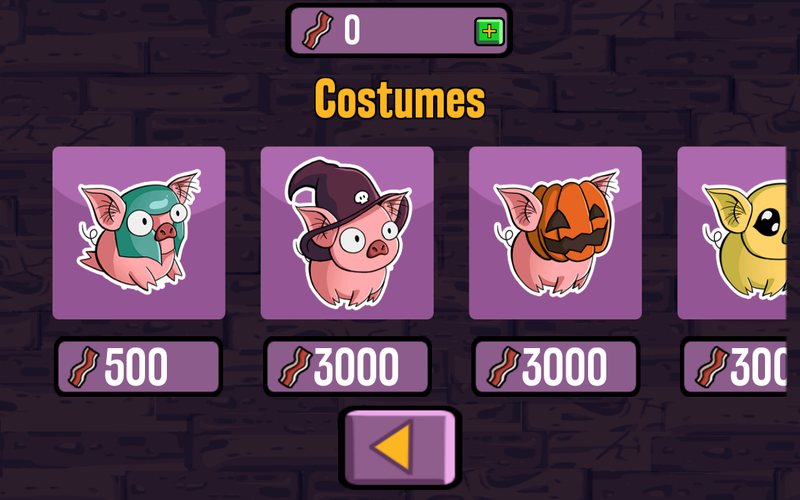 My fiance and I made a game called Magma Pig and released it yesterday on Google Play for Android devices. We'll be porting it to iOS soon! 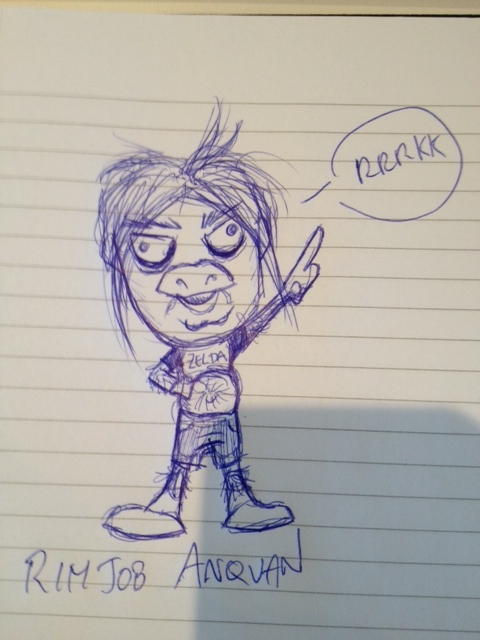 I did the arts LOOK AT THE PIGGIES! So what is this? Well, it's an infinite runner with a unique twist: you have to spawn the platforms yourself. It's pretty tough but I think it's a lot of fun. 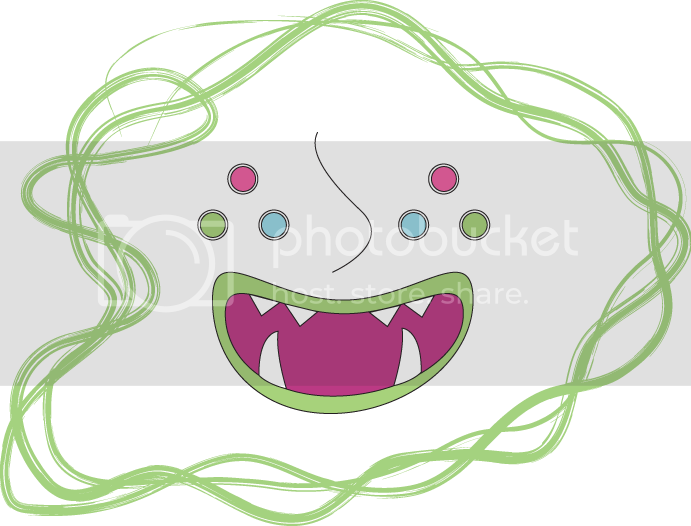 Graphics / Amalgamancer :: An Art Blog of Monster Fusion! 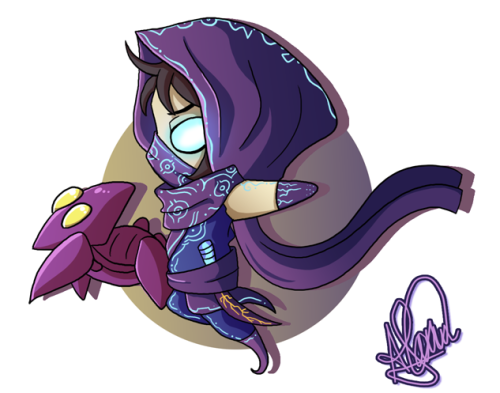 WELCOME to Amalgamancer :: An Art Blog of Monster Fusion! Yeah I bet you guys are like "what the heck is this" or "what the ! 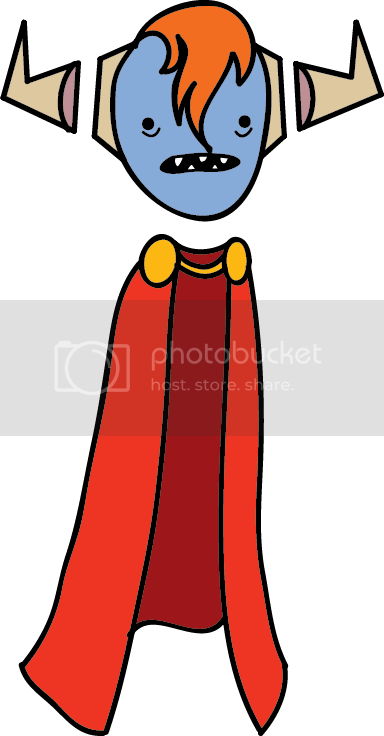 @#$% is an amalgamancer". An Amalgamancer is a being that can fuse monsters together to form new ones! Okay on a more serious note, I started a new art blog because I had this crazy idea. 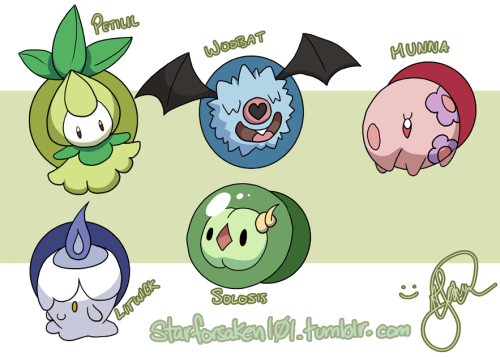 I really love monster design and I think it'd be cool to randomly choose two and fuse them together once a week. 1) I randomly choose two legendary creatures out of the List of Legendary Creatures wikipedia list. There's a vast array of monsters/creatures on there so I can't imagine running out of ideas. 2) In a week, I must draw the fused monsters together and submit my art. This will most likely happen on Mondays. 3) Goto 1 and repeat blabla. You may send your submissions to amalgamancer@gmail.com and I will post them in a photo album dedicated to that week's monster fusions! Will probably post them on the Tumblr page too. Feedback / ZFGC...what do you love? Lately the community has been quiet, and I realize there really isn't that much going on to excite the community as of late. We already have a thread listing things people hate, but...what do you guys love? What would you like to see more of? More contests? More collaborative works? I invite you all to throw in your suggestions! Hey guys! This will be where I make updates and stuff about my art. Alright, I'm not actually 100% sure this is the best place to post my art but it's the only way I see fit for now, unless we make some sort of art board that has nothing to do with graphical resources. Anyway, I really like to draw. I draw on my spare time because I love to do it. 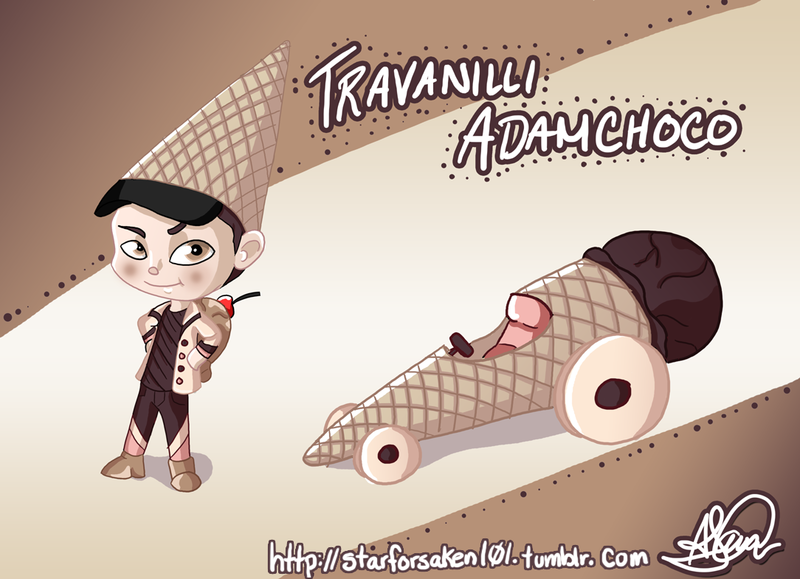 I sometimes draw concept art for the community project here too. I take part in an art blog with friends (who are waaaaaaaaay better than me) and equally like to draw some chibis and stuff on the side. Art Blog: http://oliroth.tumblr.com <- seriously check us out. I have opened commissions. They're pretty cheap if anybody wants. Also please feel free to spread your own art stuff in here too. I don't mind ^_^. 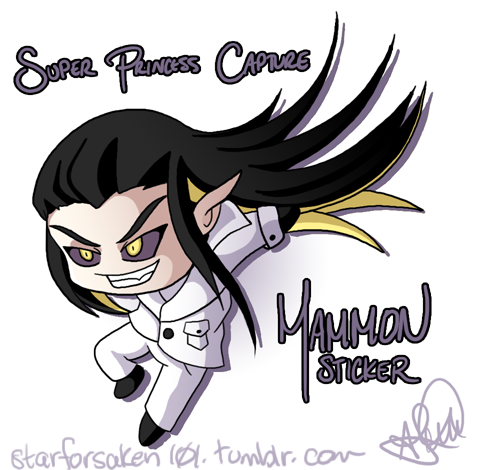 My original character, Mammon, for a game I was developing on my spare time. 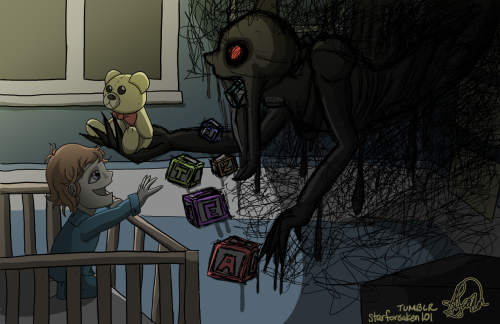 An original I drew for a theme called "Imaginary Friend" for our art blog. Feedback / Secret Santa ZFGC-Style! Alright guys. I came up with a crazy idea for Christmas/Holidays: SECREEEET SANTA!!!! Now, I know what most of you are thinking: but I don't want to spend money for people on the Internets. FRET NO MORE, THAT'S NOT WHAT THIS IS ABOUT! DRAW A NAME, DRAW THAT PERSON! That's right! We pool together the names of people who want to take part, you pick a random name, YOU DRAW THAT PERSON!!!! OH YEAH!!!! 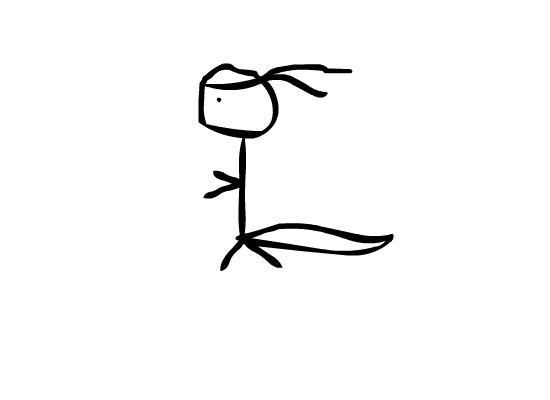 It doesn't matter if you draw, sprite, or have no artistic skill whatsoever. Anyone can take part to make this silly idea as silly as possible. Sooooooooooooo...who has seen Wreck it Ralph? I loved it and blablabla, but this is besides the point. 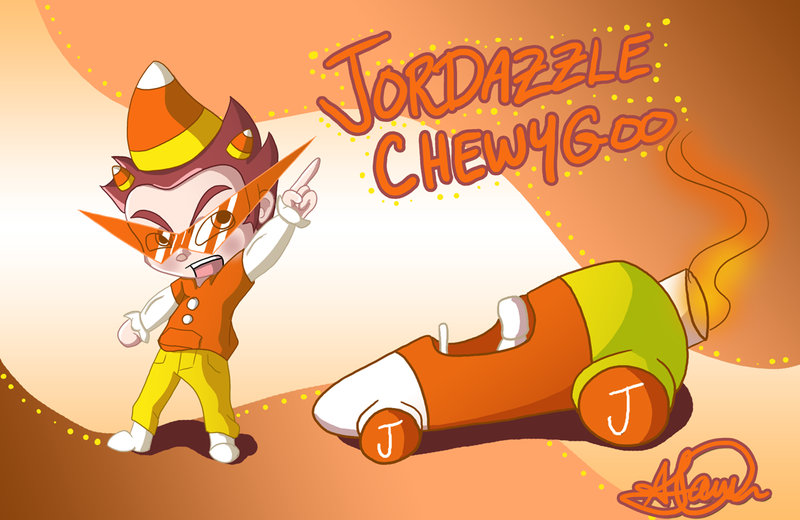 My friends at work started drawing themselves as Sugar Rush racers (based off of the movie) aaaand I jumped on the bandwagon. I started drawing a few buds as well since the first one was such a hit. I drew me, Mamoruanime, and DJVenom . If anybody feels like drawing some too, feel free to post them here!!! ^____^. 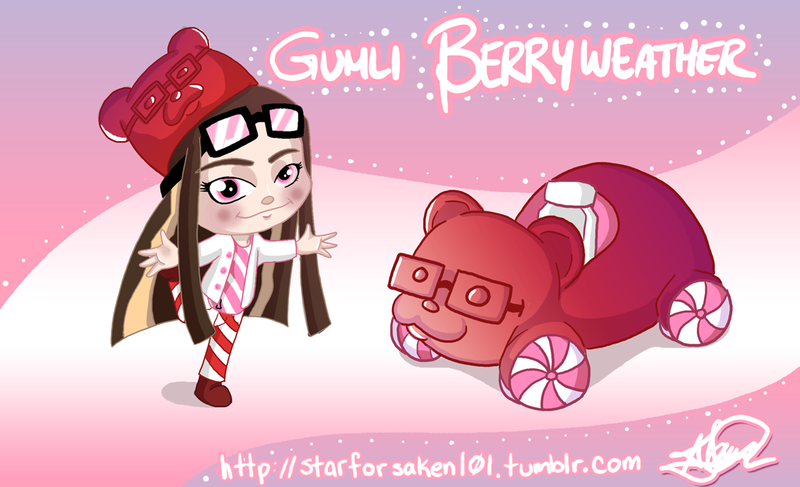 ^^ That's the cutest I'll ever draw myself btw. 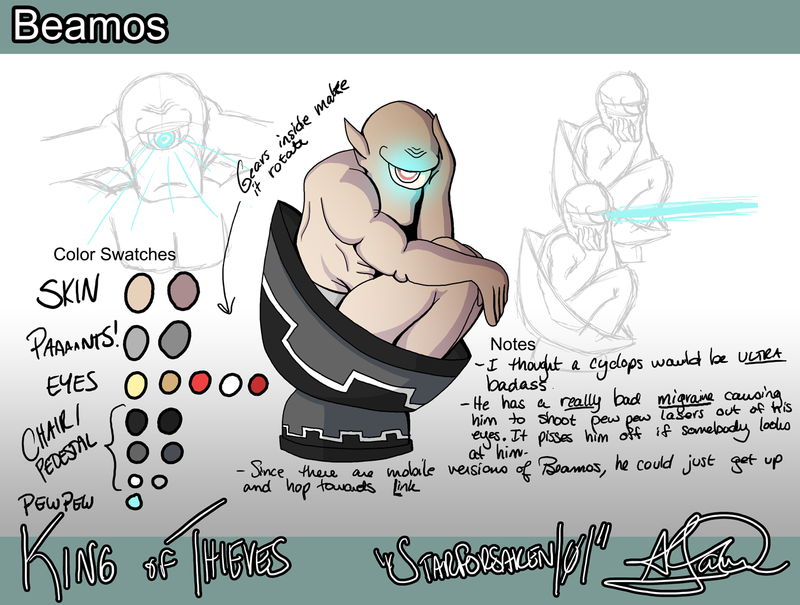 Alright so...I had this crazy idea where maybe the Beamos could be a Cyclops...so that's what I did! Here is Beamos. It stays mostly true to the original design except instead of making it a boring pillar, I made it a Cyclops sitting on a pedestal that moves in a circle. He has a really bad migraine, causing him to be lethargic and extremely easy to startle. If anything runs past him or even looks him in the eye, it'll ! @#$% him off and make a beam shoot out of his eye. It is extremely painful to him and he's seen almost always cradling his head with his hands. I got this idea after reading that some Beamos in dungeons like the Celestial Clock are mobile; this way, the Cyclops can actually stand up and hop towards Link. This thread is to discuss the plot for the second part of the story. Please elaborate here. I know this doesn't sound like much but alas, Max and Niek know more than I do . Management / The Great Cleanup of Submissions! 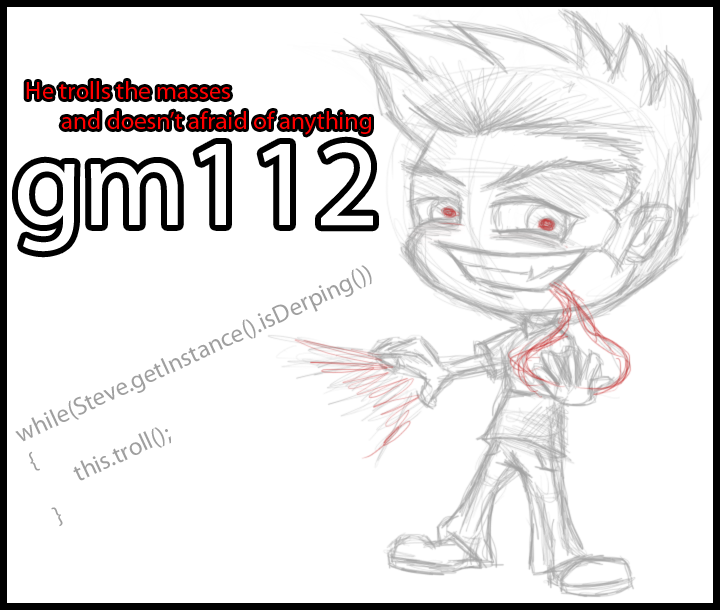 So, many of you already know what I'm up to, and Max already started doing this with the NPCs board. Basically, what I'm trying to do is dig up old submissions that have been left in the dark and try and discuss whether we need to approve of these or reject them, or revise. I'm going to be editing the tags of the ones we recently discussed to REVISE as most of them require revision and will poke the original posters about whether or not they wish to develop on these ideas. This is it! This is the ultimate showdown of 2012! 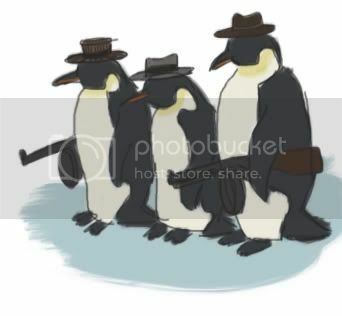 We have Icepick Vinnie, the mafia penguin with an attitude you don't want to mess with, and we have Burnout, the leading cause of stress in America! Who will reign victorious? It is up to you! Will it be Icepick Vinnie? Or Burnout? This poll will last 3 days. You may vote only once. If you change your mind, you may change your vote before the poll expires. The results of the poll will only show when the time is up! In this round of the Frostnova Division, we have gm112, the trolling troll who doesn't afraid of anything, and we have Icepick Vinnie, the mafia penguin who can avoid jail! In this round of the Inferno Division, we have Burn Out, the flame lord who can even demolish demons, and we have Plait, the Arcanian lord of videogames! In this round of the Frostnova Division, we have gm112, the derpiest of the derps, and we have That Dragonite with the Fancy Top Hat, the Dragonite with style! In this round of the Frostnova Division, we have Diabolus, the devil of Zordan's funky grass cutters, and we have Icepick Vinnie, the possibly adorable but mafiozo penguin! In this round of the Inferno Division, we have ANQUAN, the fart monster of OOT2D, and we have Plait, the Arcanian videogame-loving prince! In this round of the Inferno Division, we have Burn Out, the man-thing made of fire, and we have Yan, the petrifyingly cute chick with powers that CAN KILL YOU! In this round of the Frostnova Division, we have gm112, the mantroll with an epic destiny, and we have Marrel, the retired wizard! In this round of the Frostnova Division, we have The Gardenia Knights, the knights who fight for their friends, and we have That Dragonite with the Fancy Top Hat, the Pokemon who is clearly like a sir! In this round of the Frostnova Division, we have Icepick Vinnie, the infamous mafia penguin, and we have Box, the man-eating fox! In this round of the Frostnova Division, we have Diabolus, the unseen mystery behind this very forum, and we have Gumbo, the...wait...what?